Hi Guys, Now we are back with another offer to earn free paytm cash.AllOut is now giving Free PayTM Cash with New Ultra Refill pack . 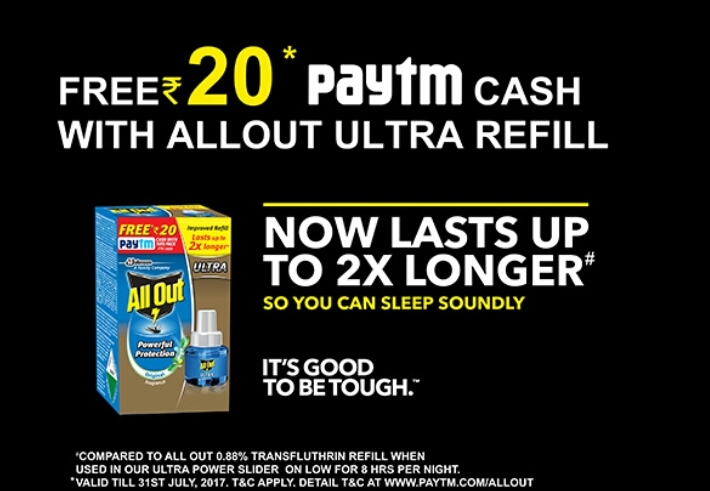 You can grab Rs.20 Free Paytm Cash From Every Ultra Refill pack of AllOut. So purchase AllOut ultra Refill pack and Get Free PayTM Cash. Now Paytm offering Free Paytm cash coupon with AllOut Ultra Refill Pack. You can get Free Rs.20 Paytm voucher with AllOut Ultra Refill Pack and you can grab these products from Nearest store or from any online sites like Amazon.